For many years, I kept paper with me at most times in order to doodle, make lists, or take notes. One day I decided that rather than utilize scraps of paper or sticky notes for these activities, I would purchase a small journal so that I would have a collection of stored recording. In addition to sketches, lists, and so on, I also use the book for mind map brainstorming. Although cluster brainstorming has been around for a long time, the term "mind map" was coined by Tony Buzan. In a previous post you will find information about mind mapping apps. Tony Buzan recommends that mind maps consist of a series of one-word clusters and also incorporate graphic elements for in order to enhance visual learning channels. In my last post, I shared a mind map summary of the book Decisive: How to make better choices in life and work by Chip Heath and Dan Heath. Frequently, I use text-based mind mapping to capture key phrases or titles. For each subsequent level of detail, I highlight the words using different colors. For example, for the Decisive mind map, the title is blue, the section level is pink, followed by green chapter titles, and orange key points. After drawing this mind map, I decided that I wanted to use it as part of my book summary. Using my flatbed scanner, I scanned it as both a magazine and document. I was disappointed in the results because the orange highlighting was not captured accurately. 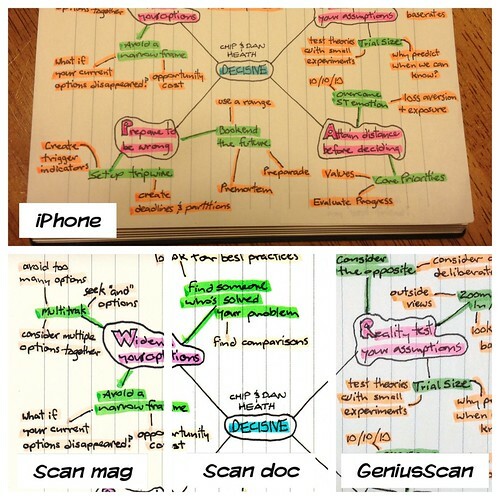 I scanned the mind map again using the GeniusScan app on my iphone. The third attempt, using GeniusScan, resulted in the best color quality. One of the features of GeniusScan is that it will correct the perspective. After some post-scan editing to correct the white balance (Filterstorm) and add my watermark (iWatermark), I uploaded the image to Flickr. Below is a collage of the different scanning attempts, including take a picture directly with my camera.